GET A 10% DISCOUNT ON EVERY BOOK YOU ORDER FROM THIS WEBSITE! For a ONE-TIME fee (not annually like Barnes & Nobles or other book clubs) fee, you get a 10% discount on all books, reports, software, audio and DVD courses you order from this web site. Website visitors who take advantage of the many resources on our web site, will get the one-time fee back in savings alone with their first order or surely within the next six months. Twenty years back, a landlord suggested "...that because he orders real estate books often from MRLANDLORD.com, there should be a way for him to receive discounts off all his orders." He was right! Our Discount Book Program was then formed. Since then, Book Club Members save hundreds of dollars each year. In addition, all new Book Club Members will receive a free best-selling real estate book as a new membership bonus. The bonus book is Robert Irwin's classic BUY RIGHT, SELL HIGH. Robert Irwin has invested successfully in real estate for 40 years, and has shared his expertise as a highly respected real estate consultant and author of more than 25 popular reader friendly books. In this 215 page book, he shares time-tested principles on how you can make a profit when you buy a house, not just when you sell. Irwin presents detailed strategies for buying right that will protect you from a down real estate market and maximize your profits in an up market. Discover how to be a ruthless buyer and ask key questions with an eye to future profitability. Irwin helps you select investors dream houses, offers vital advice on purchasing, and provides essential information about pricing, timing your purchase and resale and negotiating the best deals. New Book Club Members will also receive 100 Cyber Club Points that you can use to earn more free books!!! 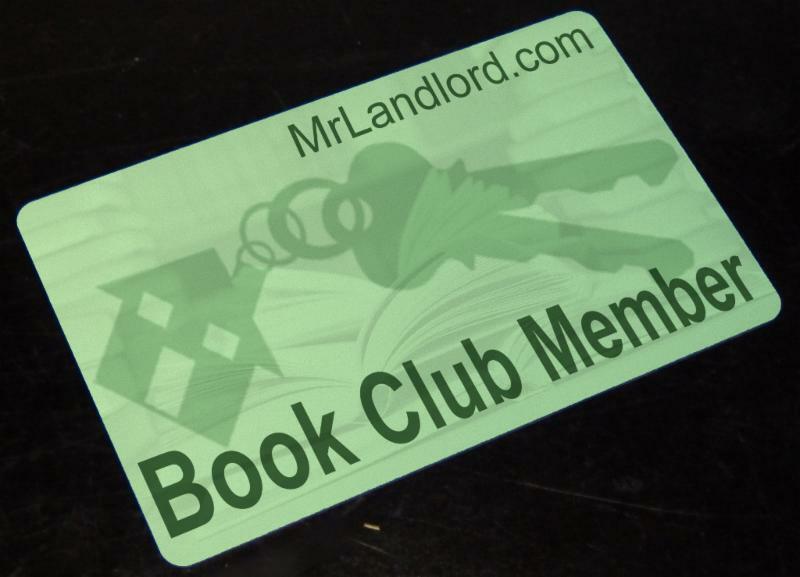 The Discount Book Club Membership entitles you to a 10% discount on all future web site book orders through the MR. LANDLORD web site, starting with your very next order, plus we will immediately send you your copy of the bonus book BUY RIGHT, SELL HIGH.... The cost of the Book Club membership is only $25, which again is a one-time fee only. Once you are a member, you will be able to enjoy discounts on all orders for years to come! The savings from just one purchase of a Home Study Course from this site will more than pay you back this small one-time cost. To enroll, Click below!